Before embarkation: When you make a reservation, we ask for you to specify a time for delivery of your luggage at Canada Place. At the time of delivery, you are requested to wait outside the terminal building. Our van will pull up in front of the terminal building for curbside delivery. After disembarkation: If you are a cruise ship passenger with a reservation, you will find our vehicle waiting for you right outside the main terminal building. As you step outside the terminal, look around for your pickup vehicle. It can be parked right in front of the building or across the street depending on availability of parking spots. If you cannot make it outside the terminal by the designated pick-up time, please give us a call at 1-888-411-5260. You also need to call us if your disembarkation goes smoothly and you are able to leave the terminal before the designated pick-up time. In that case, we may be able to dispatch a vehicle sooner depending on our availability. Our pick-ups and deliveries are conducted at the curbside. As such, we ask that you meet our vehicle outside the designated pick-up/delivery location at the time you specified on your reservation. For example, if you reserved a pick up from Hilton at 1pm, please wait outside the main entrance or inside the lobby where you can see our vehicle pulling up in front of the hotel at 1pm. It is especially important for you to meet us outside the building if you are an Airbnb guest because we have no way of entering the residential buildings. If you would like your luggage to be delivered to you at the airport prior to your departure, we ask that you to specify the flight number and preferred delivery time when you make a reservation. Our online reservation form prompts you to enter your flight number and the specific time for delivery. We advise setting the delivery time at least 1 hour before a domestic flight or 2 hours before an international flight. When you get to the airport, you will see a sign above each terminal entrance. These signs list the names of the airlines closest to each specific entrance. We ask that you wait outside the terminal in front of the entrance associated with your airline. Our delivery vehicle will pull up in front of you at the specified time of delivery. Please note that we are not allowed to idle in front of the terminal if you are not present. As such, we need you to be waiting for us at the curbside at the specified time of delivery. If you anticipate delays in getting to the airport, please call us to change the time of delivery: 1-888-411-5260. Please note that if you would like to change the delivery time by more than 15 minutes, there may be additional charges associated with the change depending on our delivery schedule at the time. If you would like us to deliver your luggage to a hotel, we can leave it with the concierge prior to your arrival at the hotel. Most hotels take your luggage to your room before you check it if we deliver it before you arrive. This is a great service you would like to take advantage of. When you make an online reservation, please add a note if you prefer us to leave your luggage with the hotel employees. Otherwise, we will ask for you when we get to the hotel for delivery. If you do not specifically ask for pre-check-in delivery, we will leave you luggage with the concierge only if you are not available at the hotel at the designated time of delivery. ​If you would like us to pick up your luggage from you at the airport upon your arrival, we will obtain your flight information so that we can keep track of your flight status. Upon landing, please call us after picking up your luggage from the carousel. Our vehicles will be waiting outside - a few minutes away from the terminal. Upon receiving your call, we will dispatch a vehicle to the pick up location. You need to leave the terminal with your luggage, turn left, cross the street, and walk about 10 meters to the pick up location where you will find our vehicle. Please note we are not allowed to idle at the pick up location if the passenger is not present. As such, we need you to be present at the pick up location immediately after calling us for dispatch. Delays: Although we obtain your flight information as part of your reservation, we still need you to specify a pick up time as a reference. For example, if your flight is scheduled to land at 1:00 pm, you may want to enter 2:00 pm as the pick up time to allow for customs and luggage retrieval from the carousel. If we notice any delays associated with your flight, we simply add the delay duration to the pick up. For example, if your designated pick up time is 2pm for a flight that is scheduled to land at 1pm, we will change the pick up time to 2:30pm if your flight is delayed by 30 minutes. We understand in certain situations, your post-landing procedures (passport control, customs, luggage retrieval) may take longer than expected. If this is the case for you, we expect you to call us and inform us of additional post-landing delays. Per our policy, we will deem your reservation a no-show if you fail to call us within the 15-minute period after your scheduled or modified pick up time. In case of longer delays, we may be able to wait for you depending on our availability if you call us on a timely basis. In case of longer waits, we charge $1.00 per minute past the 15th minute after the scheduled or modified pick up time. For example, your flight is scheduled to land at 1pm and your scheduled pick up time is 2pm. Your flight is delayed in mid-flight for 30 minutes and we modified your pick up time to 2:30pm. We expect you call us by 2:45pm at the latest. Otherwise, you will be deemed a no-show and your reservation will be cancelled automatically. In case you experience post landing delays and call to let us know before 2:45pm, we may be able to wait for you longer and if we do wait, we will charge $1.00 per minute after 2:45pm. If you would like us to pick up your luggage from you at the airport upon your arrival, we will obtain your flight information so that we can keep track of your flight status. Upon landing, please call us after picking up your luggage from the carousel. Our vehicles will be waiting outside - a few minutes away from the terminal. Upon receiving your call, we will dispatch a vehicle to the pick up location. You need to leave the terminal with your luggage, turn right, and walk about 10 meters to the pick up location where you will find our vehicle. Please note we are not allowed to idle at the pick up location if the passenger is not present. As such, we need you to be present at the pick up location immediately after calling us for dispatch. Delays: Although we obtain your flight information as part of your reservation, we still need you to specify a pick up time as a reference. For example, if your flight is scheduled to land at 1:00 pm, you may want to enter 1:30 pm as the pick up time to allow for luggage retrieval from the carousel. If we notice any delays associated with your flight, we simply add the delay duration to the pick up. For example, if your designated pick up time is 1:30pm for a flight that is scheduled to land at 1pm, we will change the pick up time to 2pm if your flight is delayed by 30 minutes. We understand in certain situations, your post-landing procedures may take longer than expected. If this is the case for you, we expect you to call us and inform us of additional post-landing delays. Per our policy, we will deem your reservation a no-show if you fail to call us within the 15-minute period after your scheduled or modified pick up time. In case of longer delays, we may be able to wait for you depending on our availability if you call us on a timely basis. In case of longer waits, we charge $1.00 per minute past the 15th minute after the scheduled or modified pick up time. For example, your flight is scheduled to land at 1pm and your scheduled pick up time is 1:30pm. Your flight is delayed in mid-flight for 30 minutes and we modified your pick up time to 2pm. We expect you call us by 2:15pm at the latest. Otherwise, you will be deemed a no-show and your reservation will be cancelled automatically. In case you experience post landing delays and call to let us know before 2:15pm, we may be able to wait for you longer and if we do wait, we will charge $1.00 per minute after 2:15pm. How much does luggage storage cost? We recommend reserving our services as soon as your itinerary is created. If you are not sure of the number of luggage items, don't worry; we can always make adjustments later on. What is important is to secure our services in advance because our capacity is limited. Most of our customers reserve months in advance of the busy cruise season. We do not charge you at the time of reservation and we have a free cancellation policy in case your itinerary changes. I will arrive in a cruise but I am not sure about the exact disembarkation time. What time should I put in as the pickup time? We recommend adding an hour to your scheduled disembarkation time to estimate your pickup time for the reservation. We understand it is difficult to be on time due to the unpredictable nature of cruise ship disembarkation process. No worries. We always have a vehicle waiting near the cruise ship terminal. As soon as you clear customs, please call your driver directly to coordinate your pickup. You will receive your driver's contact information before the date of your pickup. How much does it cost to pick-up and deliver my luggage? In downtown Vancouver area, we charge 14.99 per reservation for pick up/delivery. Pick-up/delivery fees do not change based on the number of luggage items. For example, even if you have 10 bags, you will still be charged 14.99 for pick-up and 14.99 for delivery. Outside downtown area, our pick-up/delivery charge per reservation is 29.99. Please note that Canada Place Cruise Ship Terminal is located in downtown Vancouver and pick-ups from and deliveries to Canada Place is 14.99. Pick-ups from and deliveries to Vancouver International Airport is 29.99. All hotels with a Vancouver address is considered to be in downtown. Richmond, Burnaby, West Vancouver, North Vancouver, and UBC addresses are considered to be outside the downtown area. Do I have to pay when I make a reservation? No. We only charge your credit card the night before the scheduled pick up. Therefore, you can feel free to make an advanced reservation. You can always take advantage of our fee cancellation policy. What do you charge for cancellations? Nothing! Advance cancellations are completely free. We only charge 19.99 if you are cancelling within the last 24 hours of your scheduled pick up. This is to compensate for the last minute schedule changes. Other than that, cancellations are completely free. I am taking a cruise from Vancouver. Where can I find relevant information online? CruiseMapper.com is a great website designed to provide information for cruise ship passengers. You can find information on Vancouver's ports, shore excursions, city tours, and hotels. PorterGenie is also featured on CruiseMapper. Visit www.CruiseMapper.com for more information. We charge $6.99 CAD per carry-on and handbags and $8.99 CAD for suitcases per day for storage. Each bag, however small, is considered to be single item. If you have a small handbag, we advise to pack it in your suitcase to lower your storage cost. Please note that we charge double for non-standard items. For reference, items such as bikes and ski bags are considered non-standard items. Can we drop off our luggage at your storage facility? No. We only operate on a pick-up and delivery basis. Our storage facility is off-limits for customers due to insurance limitations. We have a modern storage facility with electronic access controls, CCTV cameras, and climate control systems. Only our employees have access to our storage facility. Each entry/exit is logged electronically to provide further control over the movements in and out of our storage facility. 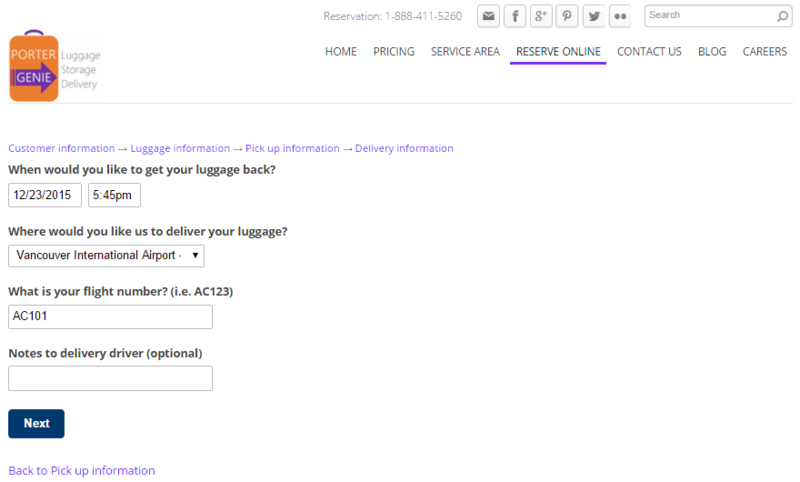 Every time your luggage is picked up and delivered, you receive an email informing you of the status change. How long can you store my luggage? We can store your luggage as long as you need. We offer discounts for long term storage. Please call us to inquire if you intend to use our services for longer than 60 days. Do you deliver to Whistler or Vancouver Island? While Whistler and Vancouver Island are outside our standard service area, we may arrange special pick-up/delivery for custom reservations. Please fill out our long distance quote request to inquire about pick-up/delivery to and from Whistler and Vancouver Island. How can I experience Vancouver? There are many tourist attractions in and around Vancouver area. These attractions are highly popular, well published, and easily accessible. You must first check off major in city destinations such as Stanley Park and Granville Island. If you would like to experience the beautiful nature in BC, we highly recommend immersing yourself in it. How? You can go for a day hike near the city and there are many trails you can choose from in the north shore. If you have more time, we highly recommend camping in one of the well maintained provincial parks in BC or backpacking to Garibaldi Lake in Squamish. If you don't have camping gear, don't worry. You can r﻿ent a wide variety of premium camping gear﻿ from www.rentoutdoors.com and have Rent Outdoors delivery your camping gear to your door steps. They even pick up from your accommodation at the end of your trip. Rent Outdoors is one of the best service Vancouver has to offer because they make experiencing the nature possible for tourists without camping gear. You will receive an email confirmation which will also include pick-up and delivery instructions. No payment is required at the time of reservation. Cancellations are free with advance notice. Reserve now to secure our services during the busy season.